Two groups of essays dealing with the peculiar vitality and character of the American West, and some literary ruminations having to do with Western writers and writing. Amongst topographical, ecological, lushly affective observations of Western land, Mr. Stegner combines a spirited conservationist bent with an optimistic view of Western destiny: "This is the native home of hope. . . cooperation not rugged individualism, is the quality that characterizes and preserves it." (Certainly a seldom-heard sentiment!) The second series of essays deal with the works of Bret Harte, Willa Cather and Bernard de Voto. From these authors Stegner evolves the endemic themes--the conflicting drives of freedom and security; nostalgia for the past; the plight of the rootless, the strength of the land-centered; the clash of Eastern culture with an expansive West. 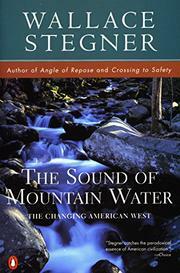 Stegner pleads for a Western literature that will meaningfully link past and present. Easygoing essays by a writer of venerable and popular reputation.